Summary: Learn how to remove tiles from a ceiling, floor or wall; remove cork tiles, remove polystyrene tiles and remove vinyl tiles. Removing old tiles is hard, messy work and there is no quick or simple way to go about the task. The length of time this job will take will depend on how well the tiles were stuck down originally, the type of adhesive used and the type of wall or floor surface they are stuck to. But here are some general tips. Although these three types of tile are very different they are equally difficult to remove and you will create a lot of mess in the process. Therefore remove as much furniture from the room as possible and cover with dustsheets those items of furniture remaining in the room. You may want to wear cushioned kneepads, as it can be very uncomfortable working in a kneeling position for long periods of time. Begin by looking for a loose tile, or a tile in a central position. 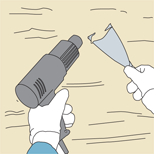 Push the blade of a wide stripping knife firmly under the tile and lift it up. Polystyrene tiles will probably break up and will be the easiest to remove. Continue with this method until all the tiles have been removed. The surface will be covered with a dry tile adhesive. This is more difficult to remove. The best way to remove the adhesive is to use a hot air stripper on small areas to soften the adhesive, which can be then scraped off the surface with the stripping knife. Having removed most of the tile adhesive with the hot air stripper and the stripping knife, you will be left with a small amount of residue on the surface. This can be successfully removed by rubbing hard with a scouring pad dipped in solvent-based paint thinners. 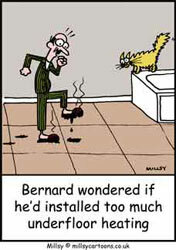 It is advisable to wear rubber gloves and safety goggles for this part of the job. 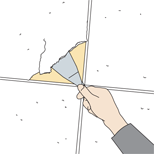 Push the blade of a wide stripping knife firmly under the tile and lift it up. Use a hot air stripper on small areas to soften the adhesive and then scrape it off with a stripping knife.